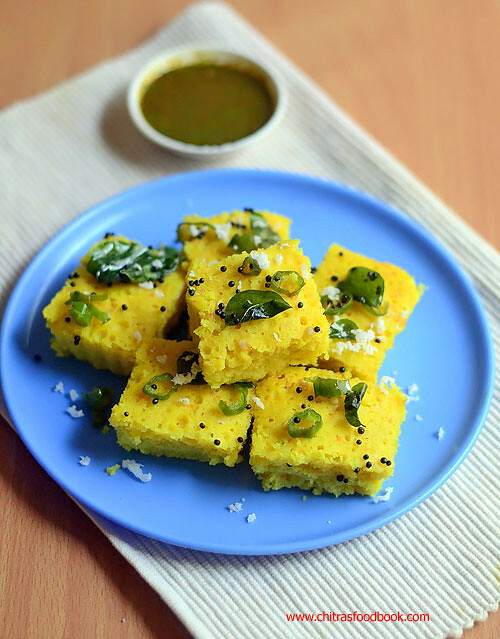 Gujarati special snack Khaman Dhokla recipe was in my try list for years. Once I had tried steamed dhokla recipe using my pressure cooker but it was not up to the mark. Then I left the idea of trying dhokla at home. Recently my friend Shalini took me to a chat shop in BDA complex, Banashankari where Khaman dhokla is very popular. After tasting there, I got tempted to try it again. But this time, I tried an easy Instant dhokla in microwave.Yes, I watched this 4 minutes microwave dhokla recipe in a YouTube video and prepared it for our teatime snack yesterday. I made green chutney as well. I halved the original recipe, made a slight change and tried it. Its so easy to make. It came out soft, porous, spongy and fluffy. 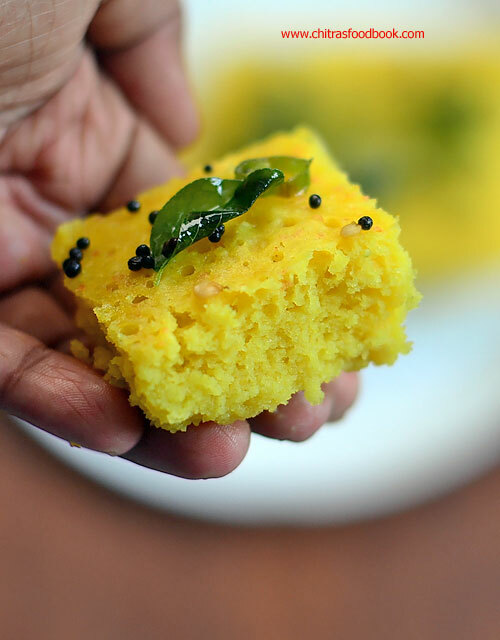 This is really a good recipe for Microwave dhokla. I am very happy with the result. In this recipe, ENO fruit salt is used to bring the softness.You can replace it with equal quantity of baking powder and baking soda if you want to make it without ENO. Friends do try this easy, microwave dhokla recipe at home and share your feedback with me.Ok, Now lets see microwave dhokla recipe with step by step photos and a detailed video! Keep all the ingredients ready before you start making.Take a microwave safe bowl ( Preferably square pan to make pieces) and grease it with oil. I used a thermal foil box as shown in the picture. Make sure the sides of box doesn’t touch the walls of microwave oven while cooking. Sparks may appear.So use any microwave safe dish if you have it or follow as I did. In a wide bowl, add besan flour, curd, water, turmeric powder, chilli+ginger paste or finely chopped green chilli and ginger, salt, sugar and cooking oil. Mix everything well using a whisk. Batter should be of bajji batter consistency. So If needed add 1 tbsp water extra. Do not make the batter runny or too watery. Dhokla won’t cook properly. So add only the mentioned quantity of ingredients. To the dhokla batter, add ENO fruit salt and mix well. Batter will become fluffy and becomes almost double in quantity. Pour the batter immediately to the greased microwave bowl. Microwave in high powder ( I Kept in 800W) for 4 minutes. (Check it once at 3 minutes). After 4 minutes, remove the dhokla and insert the back of a spoon. If it comes out clean, dhokla is done else keep it for another 30 seconds or 1 minute. 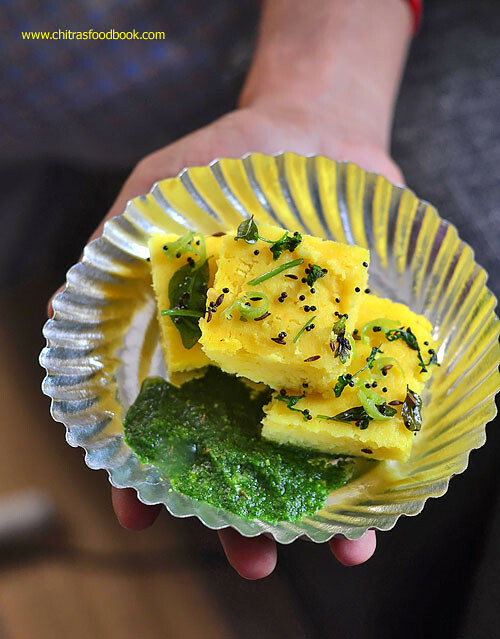 Run a knife in the corners and invert the dhokla in a plate after it becomes warm. Cut into pieces. Heat oil in a kadai and splutter mustard seeds, curry leaves and finely chopped green chillies and coriander leaves. Add water, sugar. Boil for 2 minutes. Add this water over the dhokla pieces and serve with green chutney. Garnish with grated coconut if you like ! Use all the ingredients of mentioned quantity not less than that. It will give you perfect result. Do not skip ENO. If you don’t have ENO, add 1/4 tsp baking powder + 1/4 tsp baking soda. Mix the batter and cook immediately. Do not rest the batter for long time after adding ENO. The quantity of water may vary slightly as per the thickness of curd. I used semi solid curd not thick. You can use vinegar instead of lemon juice. But do not avoid it. If your microwave high power is more than 800w, reduce the cooking time. Looks cooper soft and spongy !